I keep forgetting about Falcon and War Machine...definitely due for a do over. I'd really like to see Titanium Man and Crimson Dynamo! 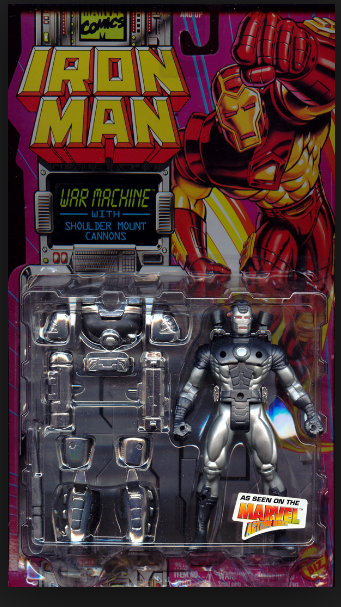 This is the only War Machine update I would ever want. I still have this little dude proudly displayed on my legends shelf. Right next to "zipline Iron Man"
Definitely "Jim Lee" Jean Grey with an extra head with a pony-tailed hairstyle. Do a running change, have one in blue and yellow costume and another with blue and orange. I'd just like her in the blue and "orange" as she appeared in X-men #1 and the animated series. I never liked the overuse of yellow on her in figure form...but I'm very picky. Lol...I picked up the sarcasm pretty fast. I agree, I would much rather see an animated series look versus the later comic one. It’s possible considering Jubilee is pretty much from the series minus her glove color. LOL And here I thought I was in the minority when I say I prefer the blue and orange. No need for a running change then. Blue and Orange all the way! I’d like to see the Sabretooth from the Apocalypse wave on the new Omega Red body, with a better headscupt. The Sabretooth we got just seemed to small. Classic comic Vulture. Classic comic Lizard, or at least a new head, legs and tail for the baf. Also a classic comic Green Goblin head for the G.G. from the Sandman wave. GG is one of those rare instances where I feel like the original ToyBiz version was better than Hasbro’s later version for the lack of a classic look alone. Do a running change, have one in blue and yellow costume and another with blue and orange. Seems a little to much like if Hasbro released a second Pizza Spidey just because some colorists used to make the blue parts of his suit black. I'm down for running changes and variants, but at 20+ a pop, I just need a better reason than such-and-such was colored a little differently in a certain appearance. Uh, don't take that Cannonball off your list just yet. I have a feeling a lot of people will be screaming "Do-Over" if it turns out the upcoming CB DOESN'T come with a pair of legs. Haha I just spit milk out on my counter. Why is the Sabertooth fig "small"? It's on the correct buck that represents all characters in the 6'4-6'5'6'6 hgt. Sabretooth is 6'6 not 7'6. That's why I hate when artists take artistic license with the established hgt of a character & draw him bigger than they actually are, cuz then you have the "Oohh, I want a figure of him that big" crowd chime in. Latest 90s Jim Lee Sabes is perfect as is., only thing I wanted that they didn't do is give him alternate open/closed fist hands & alternate 'snarling" head. They dropped the ball on Beast by not giving him a closed mouth head & now he is perpetually in a snarl pose 24/7. Hasbro needs to start making all figs with alternate head sculpts & open/closed hands. Hasbro should make a pack full of nothing but extra alternate head sculpts of figures that need it. Say a 10 pack for $49. The next Banshee they make better come with both a closed mouth head & screaming head sculpt. 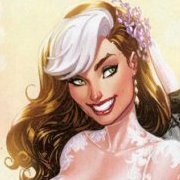 I'm picky about the way Storm is drawn. She is a tall regal woman..yet often she is drawn the same height as Jean Grey who originally was drawn shorter. To me artists these days just take over a book with the attitude of changing everyone's costumes and making their "mark" on the book for the short time they are there. It doesn't bug me so much that I put him in my top three, but I would prefer Kingpin were .5 to .75 inches shorter than he is. Exactly the same, otherwise. I don’t know, I don’t care all that much about height unless it is an obvious issue. The old Wolvie buck (Uncanny x-force) has long legs a short torso, but it still works. As long as my Tony Stark in a suit isn’t taller than my iron man figure, I can look past the other height discrepancies. It really wouldn’t be cost effective for Hasbro to retool each figure based on height anyway. I already said I prefer Blue and Orange like a few people on the thread.